It's that time again! Time to feature another one of our fabulous retailers! This week it's Sweet Little Blessings turn in the limelight! Let's get to know Coleen a little better! My name is Coleen and my husband Kevin and I live in Lancaster, PA. We have 11 children, 8 boys and 3 girls. We are expecting our 12th little one in September. After 5 boys in a row, everyone is hoping for a little girl, but I think it is pretty safe to assume that it's another boy! Right now I have 2 in cloth diapers full time. Connor who is 9 months and Logan who just turned 2. Kent is 3 and potty trained during the day, but still wears cloth at night. When I am not busy homeschooling, I enjoy sewing, scrapbooking, reading and baking. How'd you get started cloth diapering and what made you decide to open your own business? I started using cloth with our 4th baby to save money. It is hard for me to believe that was about 11 years ago! 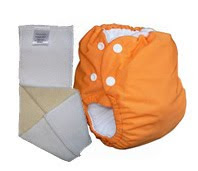 I had always wanted to start my own business and figured that I had quite a bit of experience with cloth diapers! I finally decided to start Sweet Little Blessings in July of 2008. What do you like best about being in the Cloth Diaper Industry? I like meeting new moms and sharing my experience with cloth diapers. What are your favorite Knickernappies products and why? I love Knickernappies pockets, especially the large. They have a nice trim fit for older children who still need to wear diapers for overnight. They still fit when all the other brands are too small. I also love the Doorknob Diaper pail. It hangs on a hook in my laundry room and doesn't take up any floor space which is very important since I have a very small laundry room! Special Offer: Save 10% off Knickernappies products with Coupon Code KNBlog! *And don't forget about their FREE Shipping on USA orders over $40.00! Interested in keeping up with Sweet Little Blessings product announcements, sales and more? Sign up for their Yahoo Group/Mailing list and then you'll be in the loop!